Here we are at the end of November!!! How did that happen?? This last year has just flown by and I have no idea how!!! I'm looking forward to January when things might slow down a bit.. but I'm really not holding my breathe LOL once this Christmas season is over we will be into Europe prep time as hubby and I are going next summer for our 10th anniversary and I feel like getting passports and booking thing is going to take more time than I think it should. And with that in mind I have respectfully stepped down from the Aurora Wings design team. I love working with these images but the hectic life we live isn't leaving me the time to dedicate to it that I would like and that the rest of the design team deserves. Isn't she sweet!!! I love how this turned out!! 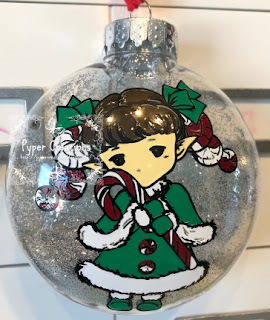 I have 5 other sprites converted into cutting files and ready to go but sadly I never got them cut and on to ornaments like I had hoped. But she is as sweet as can be and I do look forward to having time to color her one day!! PS I want to thank Mitzi and Donna for having me and for being so patient with me the last year!! You ladies are amazing!!!! I've had so much fun!!! Good Morning All!! Here we are once again with my crazy life update! LOL I swear I start my projects as soon as one challenge ends and then life happens like my new vehicle getting a flat and being parked for a week waiting for a chance to get into the tire shop for new ones. But winter came soooo early in Alberta this year everyone is getting thier winter tires on. Thank God we kept my old escape as beater so I've had something to drive. And don't forget us crazy Canucks celebrated Thanksgiving last weekend so that was a wonderful few days of family and food. So I snuck a few hours in a finished coloring this cutie this weekend. My daughters had a friend out for the weekend and all 3 of them squealed at this adorable little dragon sprite!!! For those of you that don't know we have a 7yr old Unicorn loving girl and a 5yr old Dragon loving girl in this house!! I feel like Mitzi made these images just for us!!! 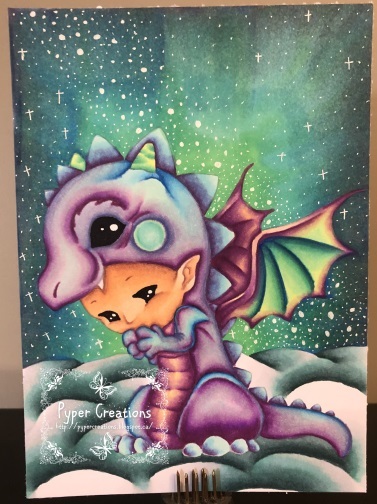 We dream dragons in this house so I wanted to give him a dream like space... I tried for a milky way across the sky but I'm not sure I managed it. I think I ended up more with a Dragon freezing in the arctic with the northern lights than space and a cloud lol. Either way I adore this sweet image and I cannot wait to color him again!!! And when you're done scooping him up go check out what all the other incredible designers have been up to!!! Thanks for popping in again!! See you next time!!! So I took one of those mornings and colored up this little darling!!! Isn't he just so sweet?? 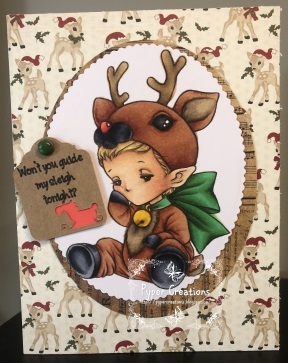 I absolutely adored working with this little Reindeer Sprite to create my card inspired by 'Rudolph the Red Nosed Reindeer"!! The season is coming!! Faster than I'd like to admit!! Even as the snow falls outside my window this morning I can't believe Christmas is coming so soon!!! And don't forget to pop by the Challenge Blog and see what everyone else has been up to!! Have a fabulous few weeks my friends!! And I will see you soon!! !